Congressman Mark Meadows, a Republican on the House Oversight Committee, was expecting this and had a prepared defense of Trump. He brought out Lynne Patton, an African American business associate of the Trumps who is now working for the Department of Housing and Urban Development. Patton’s qualification for her job with HUD was being a wedding planner for Eric Trump. With Patton standing behind him, Meadows argued, “as a daughter of a man born in Birmingham, Ala., that there is no way that she would work for an individual who was racist.” She would if she’s stupid…or an opportunist. According to The Washington Post, she’s attempting to use her position at HUD to land a reality TV show. Lynne Patton is another example of Trump surrounding himself with idiots, conmen, mafioso wannabes, and opportunists. It’s very difficult to find anyone in the Trump orbit who is ethical. Meadows was outraged and defended himself by claiming he can’t be racist because he has black family members and is friends with the chairman of the Oversight Committee, Elijah Cummings, who is African American. Meadows used the black friend defense to defend his use of the black friend defense. Republicans still don’t get that having a “black friend” doesn’t mean you’re not a racist. A Pew study found that 9 out of 10 whites who think that most blacks aren’t intelligent, law-abiding, honest, hard-working and/or generous have African American friends. Sometimes, they’re more than friends. Strom Thurmond was a racist, pro-segregationist Democrat. When his party became more liberal and the Republicans more racist, he switched. He conducted the longest filibuster in Senate history, speaking for 24 hours and 18 minutes in opposition to the Civil Rights Act. The man literally bitched for over a day about black people being able to vote. Thurmond ran for president in 1948 after President Harry Truman ordered the end of racial discrimination in the U.S. Army, proposed the creation of a permanent Fair Employment Practices Commission, supported the elimination of state poll taxes (designed to prevent blacks from voting), and supported drafting federal anti-lynching laws. Being a racist troglodyte didn’t stop Strom Thurmond from sleeping with black women and having a child with one. Having a black daughter didn’t stop him from being a racist, and if you’re a Republican, your “black friend” isn’t stopping you. Having black family members and “black friends”didn’t stop Mark Meadows from talking about sending President Obama “back to Kenya” on multiple occasions. Just call them your friend. Put on your thinking caps, kids, because it’s quiz day. Yay, quiz day! Which of these two statements, A or B, is antisemitic? A. George Soros spends a lot of money buying Democrats. B. The Israeli lobby spends a lot of money buying Republicans. Why, it’s B, you silly goose. Duh. Why is it B and A is OK? Because, B was said by a black, female Muslim. A was said by a white, male Republican. Again, duh! Now comes the rest of the column where the MAGA heads won’t understand. Plus, these are words and they probably didn’t make it this far. Just in case they’re still here, equation solving is a field of mathematics that is about finding the functions or values that will make an equation true. An equation says that two expressions are…yeah, they’re gone now. When a Democrats says something nasty, sexists, racists, or antisemitic, other Democrats are required to hold them accountable. When a Republican does the same, other Republicans get to say, “what’s wrong with that?” Democrats have to live by a higher standard. It’s like you hate America if you won’t defend its greatness, but Republicans can literally wear a red hat that says America is not great. Literally. They have a hat. Yesterday, a friend of mine on social media and a member of the Trump cult was confused by my Gucci sweater cartoon. 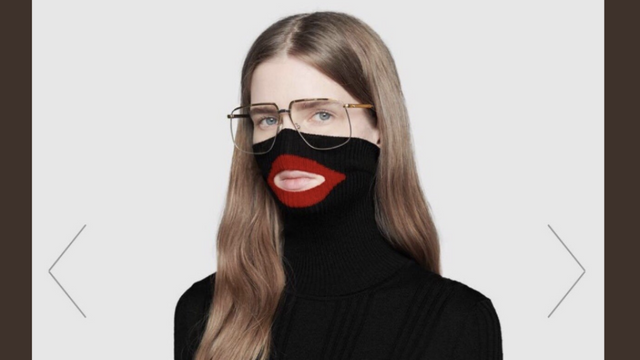 She wondered how anyone could find the sweater racist. One of her friends stated that the rules of racism keep changing. No, they haven’t. It was always wrong to wear blackface. It’s just that now, you’re being held accountable. These are the people who believe the only racism in existence is against white people except for all that racism Obama perpetuated. Every time Trump says something racist, like “Pocahontas,” or defends Nazis, they’re the ones that say, “That’s racist?” Then, they’ll call you an overly-sensitive snowflake while whining about a war on Christmas. They’re the people who think BlackKklansmen is a story of an evil, interloping, meddling, uppity black guy taking advantage of trusting Ku Klux Klan members. After being criticized by Republicans and even her fellow Democrats, she apologized. Where did she mess up? Was it the Puff Daddy quote or the mere fact she brought up money and Israel? Probably all of it. Two people who got very uptight over this was House Minority Leader Kevin McCarthy and Donald Trump, which is rich. McCarthy was threatening congressional action against Omar, despite the fact he tweeted last October, “We cannot allow Soros, Steyer and Bloomberg to buy this election!” This was right after a mailbomb was found in George Soros’ mailbox. Soros, Tom Steyer, and Michael Bloomberg are all Jewish. In case you haven’t noticed, neither Trump or McCarthy has resigned from office and neither has ever apologized. Nobody from their party called for their resignations. Omar has made some questionable comments about Israel in the past that can be accused of playing with stereotypes, which is too bad because she, being the victim of Islamophobic insults should understand the consequences. She’s also wrong about the money thing, because Republicans would still be pro-Israel without it…and every lobby spends money, whether it’s the NRA or Unions. But, criticizing Israel is not antisemitic. Last year, I drew a cartoon criticizing Bibi Netanyahu and Ivanka Trump. A lot of right-wing readers lost their minds. They even mounted a trolling campaign on one of my client’s sites, which didn’t work. But, it’s no more antisemitic to disagree with an Israeli policy than it’s unpatriotic to criticize the president’s agenda. Antisemitism is like racism to the parties. Racism is a serious issues liberals want confronted and dealt with. For Republicans, racism is a partisan tool to assault your enemies with and use to whip up your base by promising stuff like Muslim bans and walls to keep out Mexicans. My cartoon is not entirely accurate unless the last character is lying. The MAGA bar does allow antisemitism. They just won’t let you get away with it.